To be honest, I’ve always found myself drawn to Rei’s character not just due to her personality, but also for the… well, the Japanese-ness of it all. I willingly admit that as an impressionable youth with a deep interest in Japan, this fiery Shinto priestess absolutely fascinated me. I mean, I never even heard of a “mandala” before I saw Sailor Mars first shout those words in the Sailor Moon R anime. I had no idea what it was, but I knew that it sounded cool and mysterious, and had something to do with Rei’s rich Shinto heritage. Well, now that I’m older and (arguably?) wiser, I’ve figured that it’s about time that I finally take a deeper look into this. So just what is a mandala, then? A mandala [literally “circle”] is a spiritual and ritual symbol in Hinduism and Buddhism, representing the universe. So, apparently it’s not exactly as Shinto as we thought. But hey, a lot of what Rei does isn’t remotely related to Shinto anyway! We can overlook that. Especially because there are more interesting facts to be had! 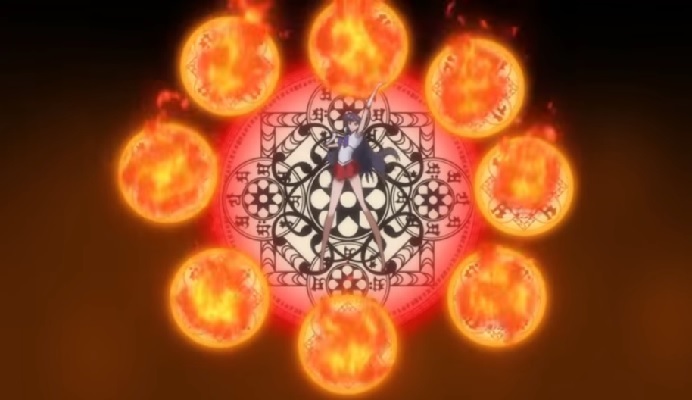 Judging by the symbols that appear in each of the eight circles in Sailor Mars’ attack, this appears to be one of the Mandala of the Two Realms3 as used in Shingon Buddhism,4 one of several Japanese branches of Mayahana Buddhism. 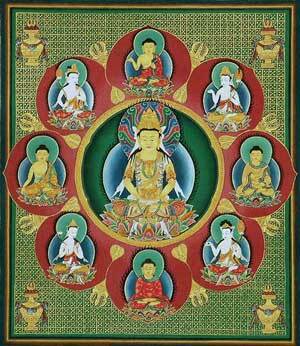 In addition to having an awesome name, the Mandala of the Two Realms consists of two mandalas: one depicting the Five Wisdom Buddhas of the Diamond Realm and another depicting the Five Wisdom Kings of the Womb Realm. If the “Five Wisdom Kings” sound familiar to you, they should! One of the Five Wisdom Kings, Acala, actually appears in the background during Rei’s Akuryo Taisan animation. This also serve as a convenient hint to where we’re going from here. And you’d be right. Listen, I majored in Japanese history and language — math was kind of optional for me. However, the Mandala of the Womb Realm consists of up to 12 “halls” or “courts,” making for as few as eight deities and as many as 414, depending on how far you want to extend it out.7 The Five Wisdom Kings are merely one of such halls — and not even the main one. 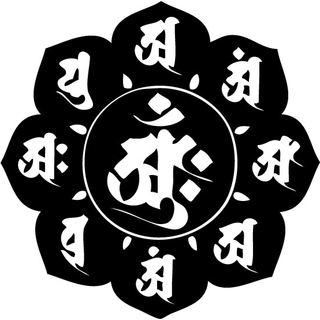 The inner-most hall, known as the “Center Eight Petal Hall,” consists of the celestial Buddha, Dainichi (Vairocana), at the center of an eight-petal lotus, with each petal alternatively containing a Buddha or a bodhisattva. In between each of these petals are vajras,8 the weapon of the Indian Vedic rain and thunder-deity Indra, which is often used symbolically to represent firmness of spirit and spiritual power. Taken all together, the Mandala of the Womb Realm is intended to symbolize the knowledge or wisdom that crush illusions. And here you probably just thought it was a cool fire attack! 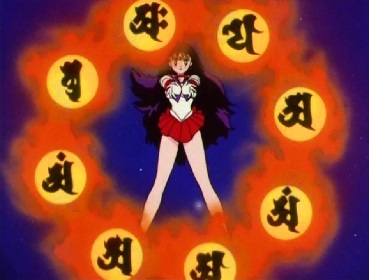 For awhile, I was actually pretty disappointed that a lot of Sailor Mars’ attacks lacked any real Shinto connection to speak of, but the more of my life I wasted time I spent reading up on the history behind her techniques, the more respect I gained for the spirituality of Rei Hino’s character. In Japan, people rarely distinguish between various religions anyway, so it’s really not that big of a deal. This also gave me a newfound respect for Burning Mandala as an attack. While it’s obviously still an entirely offensive ability, it’s great to consider that there may be some deeper meaning behind it. Now that we’ve gotten that attack out of the way, I’ve got a question for you! Are there any other Sailor Moon attacks that you’ve been curious about, or which just don’t seem to make sense on the surface? I’d love to look into more of these, so let me know down below if there are any questions you have! ← What Does Naoko Takeuchi Credit for Sailor Moon’s Success? To be honest, I’d love an in depth look at almost all of the attacks used in Sailor Moon. There are Hindu elements used in the Starlight’s attacks and the story behind Shabon Spray is interesting. If you could uncover anything regarding where Naoko Takeuchi (and the anime guys who must have came up with Fire Soul and Shabon Spray) as attack names, that’d be interesting!